Photo by: Captain Howard L. Wentworth, Sr. Built in 1936, by Rice Brothers Shipbuilding of East Boothbay, Maine as the Turecamo Boys for Turecamo Maritime. Designed by Naval Architect Merritt Demerest of Jersey City, New Jersey. She was slightly larger that the tug Turecamo Girls which had been launched in late 1932, early 1933 at Bath Iron Works. Although her main engine was diesel, the tug was outfitted with a Babcock and Wilcox steam boiler, with a working pressure of 250psi. The boiler supplied steam to oil barges that where fitted with cargo pumps for discharging cargo. She was a single screw tug rated at 800 horsepower. Her interior joiner work was built of lumber that remained after the construction of J. Piermont Morgan's yacht the Corsair which was built at Bath Iron Works some in 1930. This included mahogany, teak, and other exotic woods. Her wheelhouse and deckhouse was stained and varnished, with a white trim. In September of 1939, she towed a 250(ft) barge loaded with pontoons from the Brooklyn Navy Yard to the waters off of Portsmouth, New Hampshire where the U.S. naval submarine the USS Squalus had sunk, and was subsequently salvaged. Every Spring, she would also tow the five masted barkentine Marsala from Mill Basin in Jamaica Bay, New York to City Island, New York for use as a training ship and would make the return tow every fall. 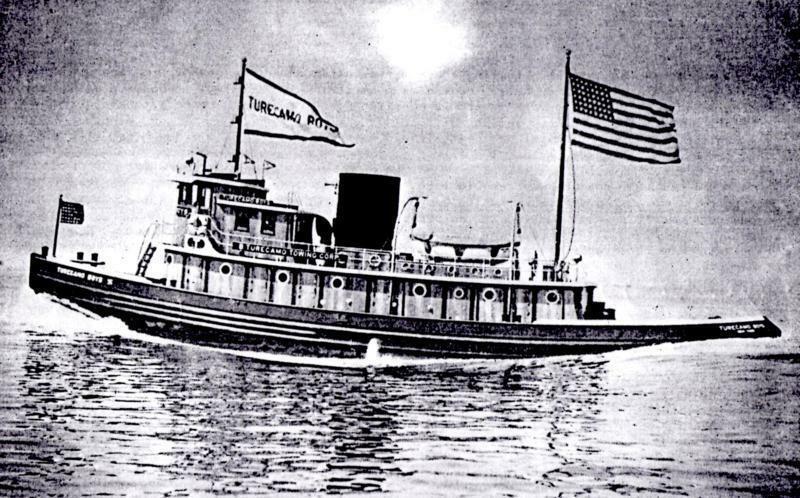 On February 26th of 1938, Captain Howard L. Wentworth Sr. was on watch aboard the Turecamo Boys when the tug Grace Ann Lee (east bound from the Kill Van Kull to Brooklyn, New York) was involved in a collision with the vessel New York Sludge . The Grace Ann Lee had begun to sink when Captain Wentworth, with two barges on a hawser astern, maneuvered alongside and retrieved the crew of six. He quickly remade his tow alongside and secured his barges at the 35th St. Pier in Brooklyn, and returned to the scene to find the tug John Timmons had moved and secured the Grace Ann Lee at the bulkhead at the Brooklyn Army Navy Terminals. In 1941, the tug was acquired by the United States Maritime Commission. A month after her acquisition the tug departed New York for Iceland. On the 17th of November 1941, she was lost in the North Atlantic. It was believed that she was the first loss of an American vessel to enemy action. Although the tug was lost nearly three weeks before the attack on Pearl Harbor.